I just received my isostick today and was excited to try it out. I have a SanDisk 64GB Class 10 card, formatted as FAT32 (using Paragon Partition Manager). Copying files to and from it via the "flash drive" interface works fine. I was able to update to the latest firmware with no issues, and have used the "ISO Manager" software to easily modify the iso_filename.txt text file without issue. The problem I'm having is it NEVER mounts an image! I've let it sit for 10+ minutes, I've unplugged/replugged the device, I've tried multiple ISO files from multiple places on the drive (folders, root, etc). Nothing ever mounts, so of course I can't test anything else (booting, etc). What might I be missing? I've scoured the forums looking for a n00b answer, but just didn't come across one. I suppose I could try reformatting the card and started over... but I've copied around 50GB of ISOs to it so I'd like to avoid spending that time again if possible. Any help is appreciated! Thanks. OS: Windows 7 Pro x64 fully up to date. ::EDIT AGAIN:: I've now tried reformatting the device again, using a different block size and a different ISO (EaseUsDiskCopy.iso). I've also tried different systems... they install everything just fine and I can access the flash portion without issue. But the ISO never mounts. I'm fairly convinced I've got a lemon, but I'm looking for advise in case I'm just too dense to see something obvious. Thanks! P.S. How's the exchange policy through your Amazon store? Edited by GuidoZ, 23 May 2013 - 10:59 PM. It sounds like the isostick firmware is not reading the FAT32 partition. Be sure the partition table is MBR, not GPT. Check "Automatically fix file system errors"
DO NOT check "Scan for an attempt recovery of bad sectors"
Lastly, it may be the format settings. While I realize this is a pain, please give Rufus a shot with these settings. Eject the drive, unplug it, and plug it back in. Regarding the exchange policy, I have a 30-day "Happiness Guarantee" - if you are for any reason unsatisfied with isostick within 30 days of delivery, I will gladly accept a return. Exchanges can be made if the device itself appears to be defective, however since yours is working fine as a flash drive, the hardware must be 100% functional. So I strongly suspect this is a firmware bug or one of the above issues. Thanks for the response. It's at the office and I'm not, so I'll give these a go tomorrow. I did try running a checkdisk, as well as RO and RW modes without success. I'd have to check the partition table. I did try Rufus at first, but it won't let me do anything to the device. It was odd... all pull-down menus were blank. I figured that may have been related, but since everything else functioned, I was hopeful to find a solution. Also a good call on the Quick Removal settings... I didn't even think about write caching possibly flagging the dirty bit! It did pop up once flagged with it when I plugged it in, but scanned with no issues. I'm eager to tinker tomorrow! If I can run any debug firmware or anything to help, let me know. Thanks! 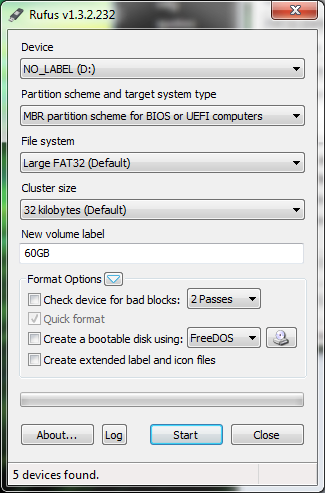 Turns out it had made an extended partition inside a primary partition when I formatted it with Paragon. Rufus still wouldn't work for me, so I fired up Active@ Killdisk, wiped it for a few minutes to clear everything out (MBR, partitions, etc). Though Rufus got further (drop downs available and able to match your example), but when run it says it couldn't access media and to replug and try again. Did that dance for a minute, then decided to try the FAT32 GUI Format again. It worked instantly, and I noticed the partition remained primary. Crossed my fingers and ran the ISOstick manager, had it setup the config folder and isosel.bin, then dragged the EaseUS iso onto it and loaded it. Nothing for 3-4 minutes. (At this point I may have cursed a bit.) Decided to peek at the removal options (it was already set to quick removal), so i removed it and changed it to read-only, then plugged it in. BOOM! The EaseUS ISO was loaded. (At this point I may have let out a yelp of joy.) Unplugged it, changed to R/W, dragged another ISO (XiaopanOS) on and loaded it, it instantly mounted and was accessible. Though I haven't checked isosel yet, I'm fairly certain I'm on the home stretch at this point. THANK YOU for your help. I was still holding out hope it was an easy fix. Appreciate the fantastic support! Edited by GuidoZ, 24 May 2013 - 11:51 PM. Yay! Glad to hear it's working, well, except for boot! Hmm.. Sadly, Dells are notorious at disliking isostick. Try putting "USB CDROM" or similar at the top of the boot order. Some Dells won't show isostick in the boot menu, but putting USB CDROM or External CDROM or what-have-you at the top of the boot priority list / boot order works in many cases. If you can get it to boot from isostick but isosel fails to work, try disabling isosel by renaming it from isosel.bin to something else, such as isosel-disabled.bin. Thanks for the reply. That's a bit disheartening, as I'm a Dell guy (and deal with them A LOT... purchased this in part for loading and doing diags on them), but I'll tinker with it and report back. I'll play with it more over the weekend and pop up things as they come up (success or failure). Thanks! Another question... is there a way to use both isosel AND something like YUMI on the ISOstick? I noticed when I booted to the CD-ROM portion, it started isosel correctly. If I stick my (lovely and tweaked) YUMI environment on the flash portion, can I pick that device for YUMI and the CD-ROM for isosel? This would open up a new world of options since I can just swap SD cards in the ISOstick. (They are much smaller than a pocket full of flash drives...) I just don't want to try it and break the functionality of what I have. (No spare microSD right now.) Thanks for the thoughts - very happy with thus far, despite the troubles and limitations. Still gonna be a hugely popular thing in my toolkit! Lots of isosticks customers work with Dells on a daily basis, so I am always working to improve compatibility with them. In some cases it is Dell's fault, but the general rule of thumb (for any machine) is: if it can boot from a USB CDROM, isostick should work with it. If it doesn't, then I have some work to do! Yep, that should work just fine! The only "gotcha" is that some BIOSes only see the CDROM -- this is because they only see the first drive in a multi-drive device. But, other than that it should be perfectly fine to use YUMI on the flash drive. Thanks for the thoughts - very happy with thus far, despite the troubles and limitations. Still gonna be a hugely popular thing in my toolkit! Thanks, I look forward to removing the limitations and making it even better! Fantastic information, thank you! If this remounting issue persists, I'd be happy to do what I can to help the project (running debug firmware, etc). On the random remount issue, I noticed it more near the beginning when I was copying a lot of data. Since finishing that, I haven't noticed it but once, and that could have been my fault (USB extension cable was already flaky). Unless it happens again with the frequency it was, I'm not concerned about it. I'm sure the issues with Dell systems are Dell's fault, as the device obviously works the way it's supposed to elsewhere. :-) I'll play with boot order and such. I noticed both boot options available on the HP which is what prompted my thought of both bootable. Being that I have replicated a number of ISOs between my YUMI and ISOstick, this would also reduce used space, besides being handy. Well... it's been a bumpy ride, but it was (yeah, was) working great. I have everything copied to the SD, YUMI was booting well from the flash side, isosel was working great, including all ISOs from YUMI... it was heaven. But it only lasted for about 2 days. It simply won't stay "powered on" now. One second it was working great, then suddenly it wasn't recognized (on the same laptop, without unplugging it or anything). I took it out, blew on it and tried again. Light came on for a second, then flickers off. Put it back in my system and couldn't even get it to come on at all at first. If I push it in REALLY hard (constant pressure) it will come on for a second, then flicker off. If I put it in normally, usually nothing happens. I am 100% positive it wasn't bumped or anything while in the system (sitting on a desk next to me the whole time). The plug feel sturdy and solid and no physical damage is apparent, but it's quite unhappy. Tried RO/RW and "safe mode" button without success. Taking out the SD card confirms it's in perfect working order. Any ideas now? I suppose if I had to swap it, it's not the end of the world - the data is on the SD. (Excellent design!) Just would need to update the FW, which is a no-brainer. Thanks for your thoughts. Oh no! It sounds like you got one of the last of the bad ones. I believe one of the panels (10 isosticks) did not fully reflow during manufacturing, causing solder failures in the field. The fact that pressing on it makes it work briefly makes me almost certain that is the cause. Unfortunately this problem was not found until the affected units were sold, and I have no way of tracing them back to an individual panel -- only a given production run -- so I can't pull the affected units from inventory. Anyway, I will send you a private message so we can sort out the details and get you a replacement right away.